The Zombie Scholars Academy was inspired by a campaign by the Centers for Disease Control and Prevention. The CDC sought to inspire greater awareness of the need to prepare for disasters – both natural and human made. 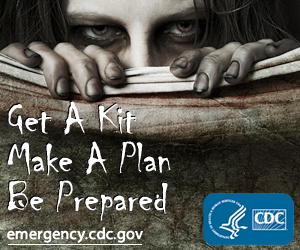 The critical point of the CDC’s campaign is to make citizens aware that basic preparation is a responsibility all citizens share – from the simplest acts of assembling first aid kits and storing water, to more elaborate plans for shelter and escape in the event of a more serious event. A key objective of the Zombie Scholars Academy is to expand student awareness of disaster preparedness. In addition to classes focused on topics such as shelter, food and water safety, and orienteering, students will have the opportunity to earn certification in essential skills of survival and basic lifesaving. Missouri has been home to some of the most serious natural disasters in recent years. The Joplin tornado touched the lives of many Missourians; families in that community are still recovering from its effects. As a state bordered by mighty rivers, both flood and drought have shaped the lives of thousands in recent years. Kirksville, the home of Truman State University, even experienced its own severe tornado and severe wind storms only a few years ago. While it is difficult to imagine a disaster on a truly apocalyptic scale – like we might see in movies – Americans experience life-changing disasters every year, and it isn’t only adults who deal with them. Here are some great educational resources for greater awareness of disaster preparedness. If you want to learn more, enroll in the Zombie Scholars Academy for a great start!